During the first class at AOA’s fall seminar held on October 2016 with Alex Peterson Sensei, Philip Sensei calls me up for ukemi. He gives me the opening and I attack. I’m on the floor, Sensei has me down: only he decides when I can get up. I feel pressure in my arm release, so I get up as fast as I can. It’s Sankyo, Sensei turns, I do everything I can to keep up with him, a pain shoots through my arm. 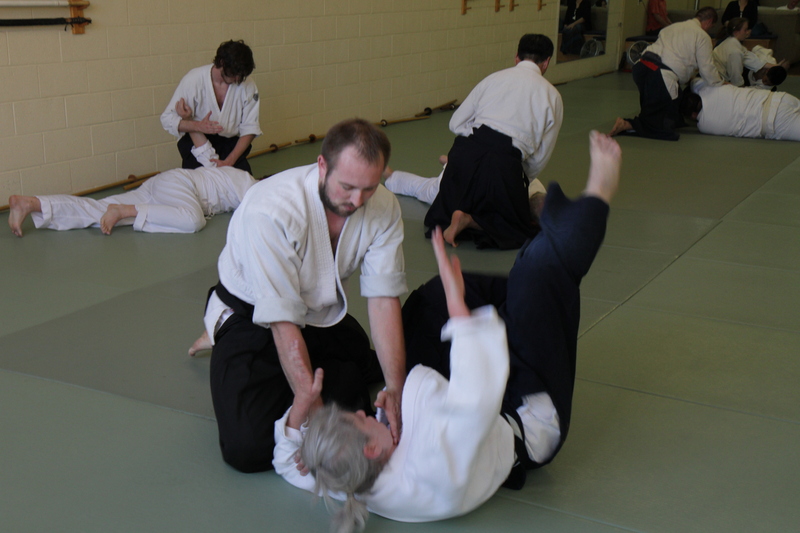 One slip, if I miss one beat, if I put my guard down for one moment, I’ll be spending the next few months sitting seiza, watching class with my arm in a cast. I’m on the floor again, all my bones still intact. 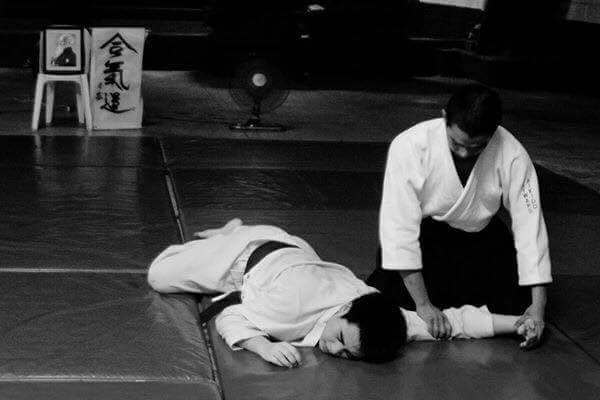 Sensei let’s go of my arm, I need to get back up, Omote is over and it’s time for Ura. Then three more sets of this. I need to get back up. During this seminar Alex Peterson Sensei said “if you want to be forged you need to go to the hottest part of the fire”. After hearing this I reflected on my own personal progression of dealing with conflict. I’ve been practicing Aikido for four years now. About three years ago I was a fourth kyu in the Soto Deshi program. I was working as a supervisor at a grocery store making just enough money to get by. I wanted to go to school but I didn’t have the money or the time. The whole reason I originally joined Aikido was to prepare to become a police officer and I needed some college credits to qualify for the academy. I didn’t want to quit Aikido, I loved it, but I needed to work, and I also needed to go to school. I kept thinking about how I could manage doing all three, but things wouldn’t fit. I needed more time and money to go to school. I could not afford to pay for everything if I cut my hours at work. If I cut my hours at the dojo how much would my training suffer? Eventually I was so frustrated I couldn’t even focus on training. 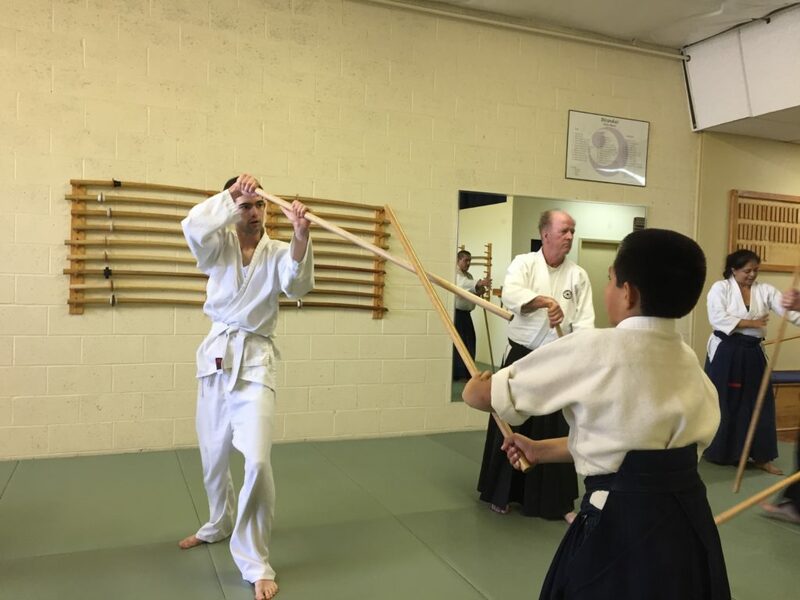 I ended up failing my third kyu test and eventually my Sensei’s recommended that I take a break from the Soto Deshi program and focus on work, paying bills, and going to school. I was told the Soto Deshi program will not be going anywhere. I was now able to spend more time focusing on work and eventually I became a manager, not easy. I would work on homework late after I got off work. 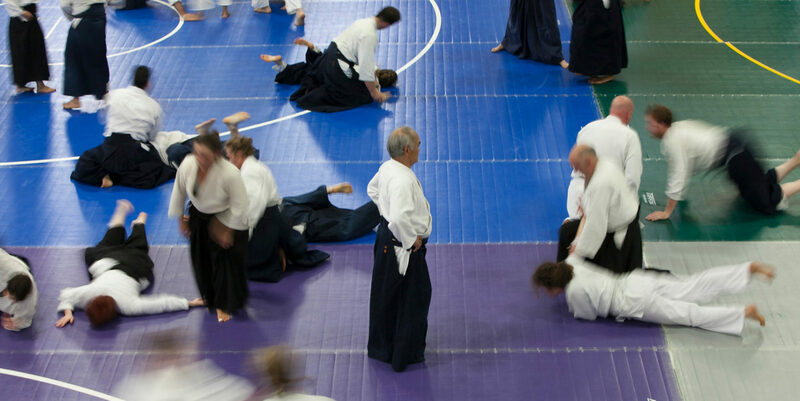 Some days I would sleep for a few hours and try to make the 6 A.M. morning Aikido class, then go to school. My hours at the dojo went up and down, and my training did suffer. I did not make the best grades and I gained about about 40 pounds and took on some debt, but at the end of summer 2016 I got the credits I needed. I stepped down from work and joined the Uchi Deshi program at second kyu. I could have quit Aikido many times and found some cheap excuse to save face, but I would be a lesser person because of it. Every time I take a class, I have some kind of obstacle to overcome. You can call it conflict, you can call it fire, you can call it yourself, but to get through it you need patience and dedication. I still don’t know how to take proper ukemi for Sankyo but I’m getting on the mat tonight. Lots of old friends and many new ones made my recent visit to England after more than a decade quite memorable. 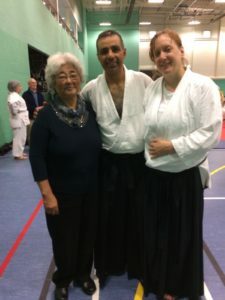 The British Birankai Autumn Course in Birmingham was my reason for the trip, a special celebration of the 50th Anniversary of Chiba Sensei’s arrival in the U.K. that brought Mrs. Chiba together with many Birankai veterans. Mrs. Chiba and Eric Beake of London Aikikai at the special memorial dinner in Birmingham, Oct. 8, 2016. 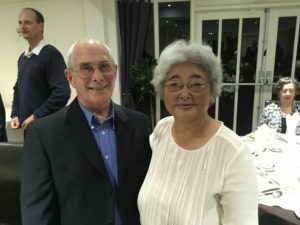 At a special dinner on Oct. 8, Mrs. Chiba offered heartfelt thanks to the many British Aikido students who helped her and Chiba Sensei make a life in London – and continued to keep the flame of his Aikido alive after their return to Japan in 1976. It was an emotional reunion with British Birankai stalwarts like Dee Chen, Steve Beecham, Tony Cassells, Joe Curran, Chris Mooney and Eric Beake. Many of these veterans also told me lots of great stories as part of my research into Chiba Sensei’s time in England for the biography project. 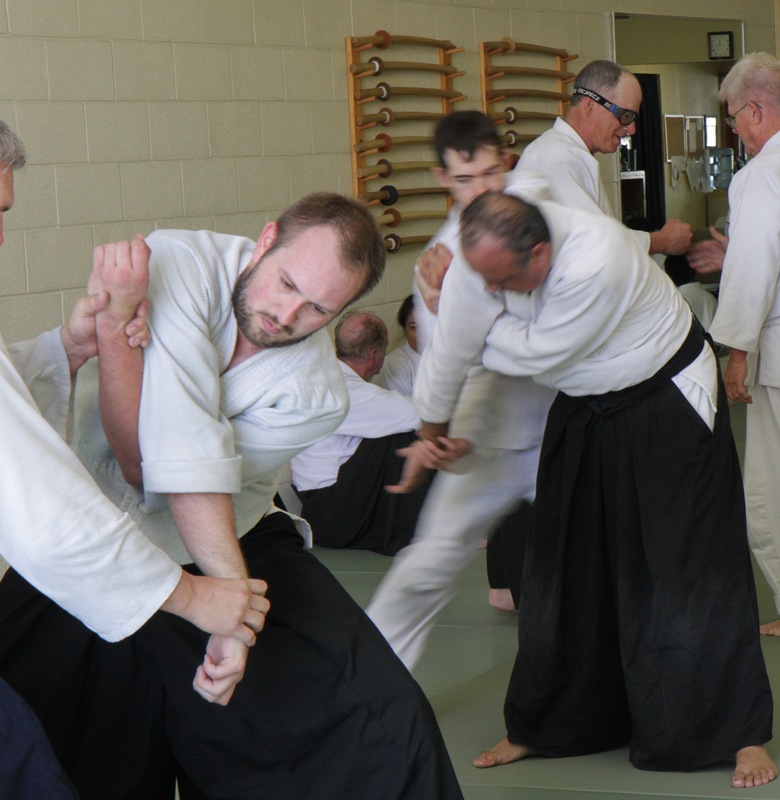 I traveled across the island in my quest to find out more about Chiba Sensei’s challenges as young man trying to bring the art of Aikido to often unappreciative audiences. I was struck time and again by the strong impression he made on so many and of the intense loyalty of his British students extending into the present day. Along with vibrant veterans, it was amazing to see future leaders like Davinder Bath and Ian Grubb come into their own on and off the mat. It was also great to see the enthusiastic and diverse new crop of students who are keeping up the very high standards of British Birankai Aikido. I was impressed and humbled. Mrs. Chiba, Miguel Moreno and Liese Klein at the Birmingham Course. Somewhat disappointing was the absence of some familiar faces due to a split within the British ranks a few years back – a warning to us in Birankai North America. Egos and personality conflicts have always been with us, but sincere, strong training will prevail, no matter the setting. One constant at all the dojos I visited in England was sliding mats – most dojos can’t afford a full-time space due to high rents and put mats down before class with no anchoring. At the seminar, the mats on the edges of the temporary dojo would slide apart with every few rolls. But every time the gaps between mats threatened to swallow up toes or fingers, a few hearty souls would pause and push them back together. After a while I stopped even noticing and got into the spirit of things – slide apart, push together. Setting up the mat before the Birmingham seminar. As the old adage says “There’s no place like home”. So when I had an oppurtunity to go back home to the Philippines, specifically Manila, I took it. It was my sister’s wedding, but I also wanted to get some Aikido training in. 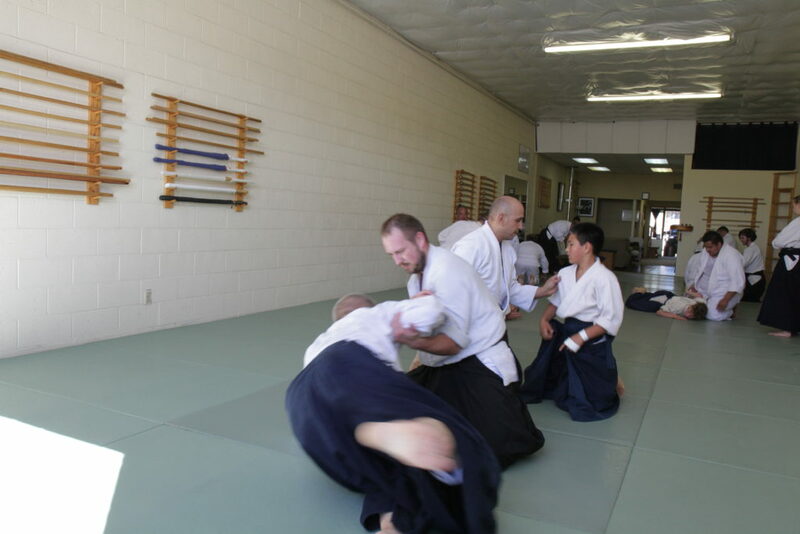 I started Aikido training in 2008 at Hayward Aikido under JD Sandoval Sensei. I was also his Kenshusei beginning in 2010 and graduated from the program in 2013, after passing the Fukushidoin test. The first thing I did was find a dojo that was close by, because as everybody that has ever been to Manila, knows how horrendous the traffic conditions are there. 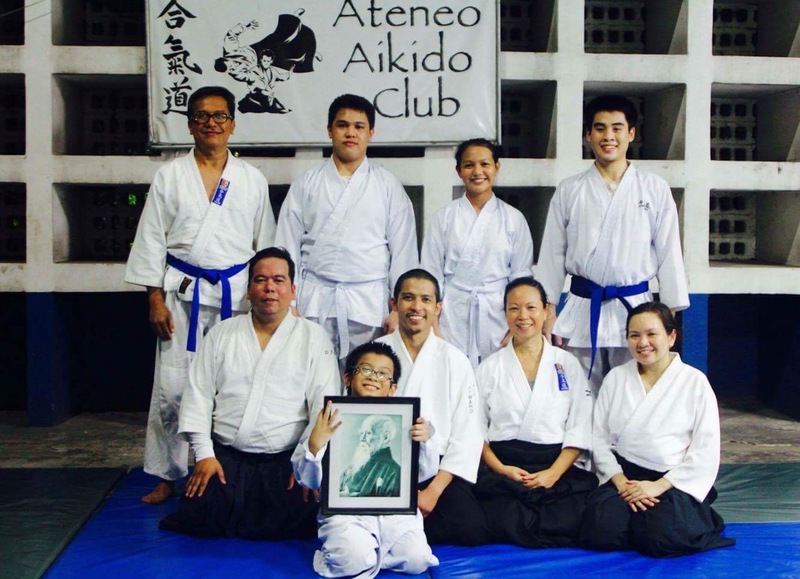 I found Ateneo Aikido Club, which was inside the Ateneo University of Manila, one of the more prestigous universities in the whole Philippines. I had already emailed them beforehand of my intention to join class. 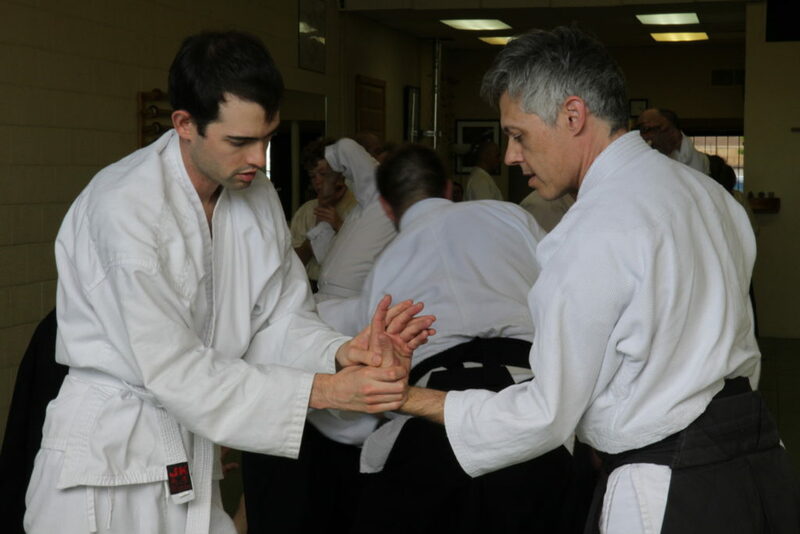 The head instructor of the dojo is Rommel Miel, a 4th dan blackbelt of the Aikikai. They gave me permission to do so. The dojo itself is located inside the gymnasium. I came a little earlier to meet the teacher and the students. 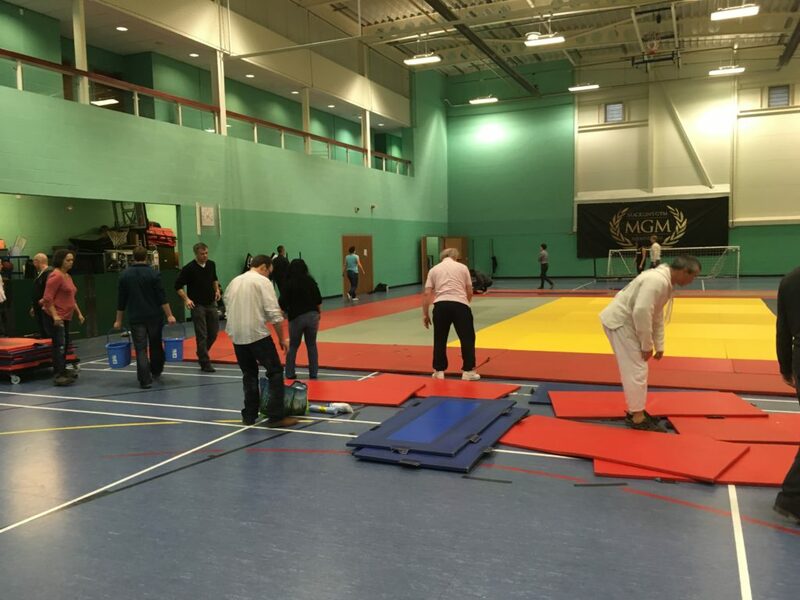 Some differences from training back in the States are that we had to set up the mats because other arts and sports were using it during the day. Also they have 2 hour classes which was a challenge due to the very hot and humid climate in Manila. The instructors themselves also do not get paid for their services, which in my opinion, is very noble and sincere in a 3rd world country, that people still do things just for the love of it. The practice was great. Very good energy was shown on the mat. After the class the head instructor asked me if I could lead class the following week. I happily obliged and the next week I did. Teaching and training in Aikido in Manila is very special to me, having grown up here and being given the chance to show the art that I have dedicated my life to. 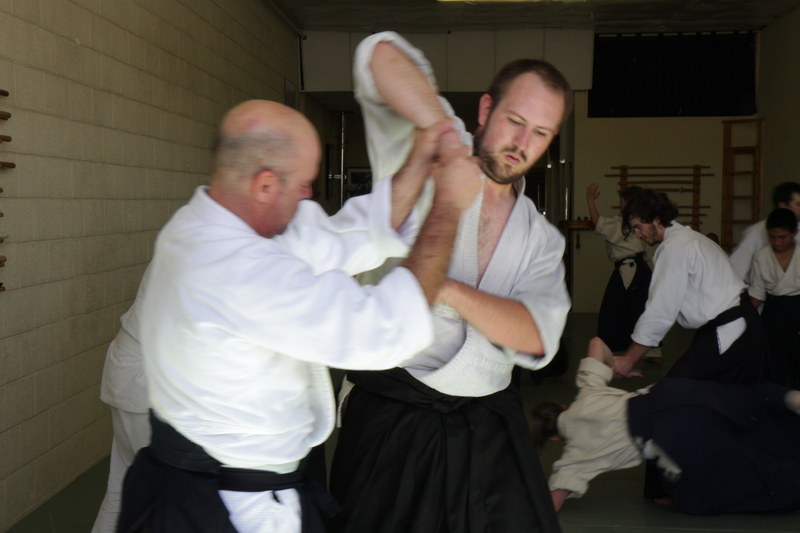 The focus of my class was to present Aikido as a true and complete martial art. Sometimes we as Aikidoka focus on the philosophical aspects of the art, that the martial aspect of it becomes secondary. I wanted to highlight the martial side of it. We finished class and I spoke about how we should all take pride that we do Aikido because it has everything, and will work on any situation or circumstance. I wouldn’t be doing it if it didn’t. After class we went out for pizza and beer at a local pizza parlor (Shakey’s! Love that place!). All in all I really enjoyed training and teaching in the homeland. I would like to thank Miel Sensei and all the members of Ateneo Aikido Club for having me and making me feel like family. Thank you very much.